We've been skeptical of the Three Gorges Dam project for a number of years. It isn't that dams are a bad idea, they are a great idea, it's just the the ecologists who endorsed the thing invented the absolutely perfect outcomes and assumed it would happen. What they needed, was a little falsification (see Falsification - Why Women And Scientists Make The Best Chess Players) but instead what they used was irrational sunny optimism (see US Ecologist Tells 1.5 Million Displaced Chinese Peasants To Find A Silver Lining In Three Gorges Dam) and now, it turns out, it has increased pollution, is a huge risk for what used to be relatively minor disasters (flooding by the Yangtze) turning into disasters of Biblical proportions and, oh yeah, those million and a half forcefully displaced people have lousy lives so US activists could coo about how environmentally terrific a communist dictatorship was for building it. Where are all the "new agricultural and business opportunities" for the 1.5 million people that US ecology experts claimed would result? What about the increased earthquakes they were warned about and that have resulted from the 410-mile-long reservoir? Not to mention the water pollution and other unknown damage to the river's ecology. According to a joint study by the Chinese Academy of Sciences, the World Wildlife Fund and the Yangtze River Water Resources Commission in 2007, 30 percent of the Yangtze's major tributaries were already seriously polluted. China has finally had to admit its $23 billion project has not gone as planned. Instead of alleviating flooding, it has hurt more in a time of drought - hydroelectric plants are useless, crops are dying and people struggle to have drinking water. Pollution in the form of terrific additives like lead and ammonium have spiked due to the "new agricultural and business opportunities" so China is forced to build more water treatment plants. It was always a big, bold project and I like that. It can be the 8th Wonder of the modern world and it's big enough to easily be seen from space. The dam itself, at 1.4 miles long and 607 feet tall, is five times larger than Hoover Dam, holds up to 5 trillion gallons of water and might produce 18,000 megawatts of electricity if all 26 turbines are on — twenty times the power of Hoover Dam. But at a time when people are concerned about climate change, the increased water has led to increased rainfall and temperature changes in an area 10X the size of what the optimistic ecological projections stated. We all recognize that drastically changing land into cities might have an impact but no one in China seemed to consider creating an ocean there would make a difference. 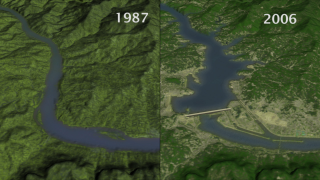 Now the "lake effect" is causing cooler temperatures and increased rainfall, but not in the immediate reservoir where fewer people now live anyway, but rather between the Daba and Qinling mountains where the temperature has decreased by an average of 1.2 degrees Fahrenheit - nearly three times the change we are concerned about by 2100 due to global warming. You never want to be right when it comes to harm and the well-being of 1.5 million people (and it could be even more - China has drastically understated everything else about this project so it could be 10 million displaced people, they aren't counting heads) and a huge chunk of the ecology, but you at least want to be less wrong and 'it will be great because it is clean energy' blinders coupled with 'we should be more totalitarian when it comes to the environment' thinking are now being played out for the world to see. It's quite rare for the communist Chinese to admit any kind of error, so that is to be applauded, and perhaps the world science community - actual geologists and not 'natural resources' professors who issue loving odes to "terraced ponds and wetlands along the borders of the giant reservoir, and establishing food production businesses that capitalize on the changing water levels" and "We're saying everyone has to think outside the box" thinking, can be included this time. The meeting of the state council was presided over by Premier Wen Jiabao and they stated they expected to have improvements by 2020. 8 years is a long time.